Confessions of a 20-something Scrapbooking Mother: Great American Scrapbook Convention! Well, its been 2 days since the GASC, and I think I've finally recuperated enough to share some pics and my recap! So first, here are some pics of some of my yummy goodies! This is a long post-sorry! These were some of my favorite things of the day! The Maya Road train album is going to be turned into Aaron's counting book! (If you don't already know-he's into trains BIG TIME now!) I got 2 new Cuttlebug folders-the Tiny Bubbles and the Floral Fantasy! The Jolees are hard to see, but the one is a little red tricycle that looks exactly like Aaron's little Radio Flyer trike, then there is one that says "Boys and their Toys", and one that says "Little Brother"! (I already found "Big Brother" a few weeks ago!) The Deluxe Cut of the Exersaucer looks exactly like ours, so I had to get it for baby Alex! And the dragon/knight Sandylion stickers were one of the few things I was looking for, and I found them! YAY! 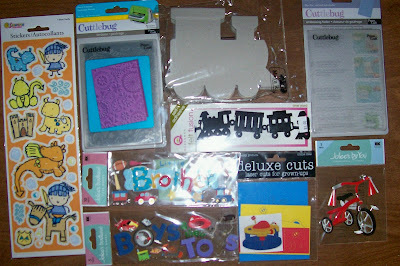 Ok, these were some things I got at the DollarScrapbooking booth. Lots of Bazzill stuff-the large blue brads, those adorable felt brads, the flower brads, the crocheted flowers, and the black chipboard alpha. Also got some Karen Foster Loopy Brads and Bug Brads, and a couple other odds and ends! By far my favorite booth!! Who can go wrong with stuff for a dollar?? 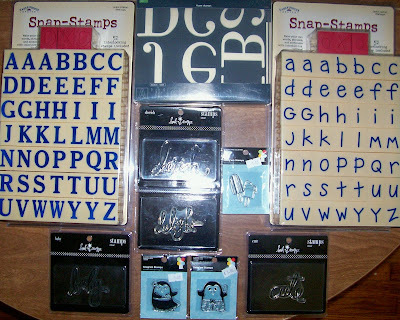 And here are the stamps I bought! There were only 2 things I was looking for in the entire convention-those Sandylion stickers, and these Imaginisce penguin stamps! I was 2 for 2! Yay! I also got the popsicles because they looked so yummy! I bought 4 Heidi Swapp stamps-cherish, baby, cute, and delight. They were at the DollarScrapbooking booth! I got the large MM foam stamps for a project for the boys that I am working on, and they were only $5! But my best purchase of the day were the Karen Foster snap stamps for $2 each!! Can you believe that?! So I only spent $17 on all of these! I am a happy camper! All in all, the convention was definitely worth it. It wasn't as good as the Creating Keepsakes Convention we went to last year, and if I had to choose, I would go to CKC over the GASC anytime! But this one was close to home, so we were able to make it a day trip which was nice. My class was great! A Quick Quotes class where we got enough supplies to do 4 layouts and a few little extra projects! I LOVE Quick Quotes classes! 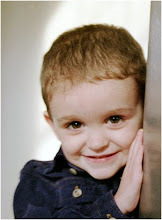 We got a free Quick Quote for taking the class, and I got this really funny one about potty training! I think Jill and I both liked the Chantilly LSS better than the convention though! She spent more at the store than at the hundreds of vendors! I can't think of the name-I think it was Scrapbooks N More but I may be wrong-but the store is GREAT. If you live locally you should make it a point to visit! They had a really large selection of EVERYTHING. Their baby/kid stuff made me very happy! They have gorgeous papers too. I LOVE paper! :) They have a huge crop room, and a place for the kids to play as well. 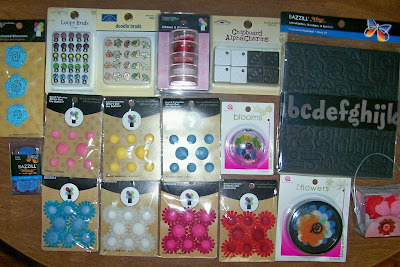 Plus they were at the convention handing coupons out, so we got 10% off our entire purchase at the store! All the employees were very nice and knowledgeable as well. Two thumbs up! So that is my recap. I'm sure I forgot something, but thats ok, I will remember later. :) Oh, the Skinny Cow ice cream was delicious as always! Its been a great weekend so far. First the GASC, then yesterday my mom and I set some things out a friends community yard sale. We made a more money than we ever have at home-enough to make up for my shopping trip!-and we even shopped a little. I didn't go far because I didn't want to overdue it. Wish I could've went through the whole thing, I bet I would've gotten a lot of good stuff! I stopped at one and almost didn't get out, but when I did-JACKPOT! Turns out the lady is a manager at Michael's, and when they change seasons, all of the $1 stuff goes on clearance for 50 cents, and whatever doesn't sell, they get to take! So she had bins and bins of M's $1 stuff for 10 cents each! 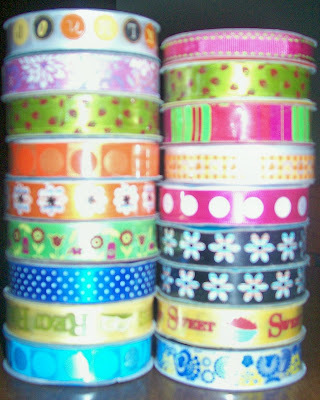 I spent $3 and bought all of this ribbon, plus a bunch of things to alter! (Sorry for the bad pic!) Then at the next sale I stopped at, I FINALLY found Aaron a Thomas train track. I found one last month at a yard sale, and they wanted $50. YIKES! This one was marked $4, but the woman was feeling generous and told me to take it for $2! No complaints from me! I would've paid $10. ;) I also got a train table freecycled to me from the message board, so now Aaron has an awesome table and Thomas track, and the whole thing cost me TWO BUCKS! Can you tell how happy I am??!! P.S. Not sure why all of my paragraphs are running together-it won't let me fix it. Sorry! Btw - I LOVE THAT STRAWBERRY RIBBON! OMG, OMG, OMG . . . I'm drooling over all of your FUN stuff! My goodness, that train felt fusion is adorable! I can't believe you got ribbon for 10 cents! WOW! You did some amazing shopping! Enjoy it all!